Marathi weddings are known for their cuisines, dance and enjoyment. Marathi weddings are full of colours and a variety of spicy dishes in the menu. 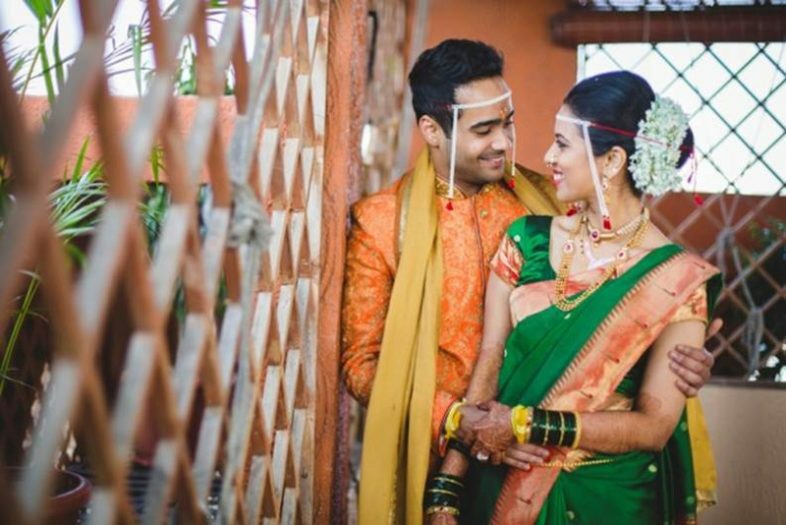 However, Marathi weddings are best known for their simplicity and no-drama wedding rituals. There are no insignificant elongated rituals and ceremonies. This is the formal engagement ceremony, which marks the beginning of wedding rituals. The bride and groom’s family offers presents to them and each other along with packets of sugar, called as Sakhar Puda. The families meet to decide the final date for wedding day. They make turmeric paste and papad together to be used in the later rituals. Kelvan is the puja held in honour of the family deity at the respective houses, followed by a lunch, in the attendance of family and close relatives. This ceremony takes place a day before marriage ceremony. The earlier pound turmeric is used and applied on the bride and groom’s head, shoulder, hands and feet using mango leaves. Wedding rituals begin with the worship and blessings of Ganpati Bappa. The bride asks everyone present in the ceremony for their blessings and touches their feet. Kul Devta or the family Deity is invoked at the venue of the wedding. Bride’s mother welcomes the groom and his family to the venue of the wedding. She then washes the groom’s feet, does tilak and aarti and feeds him sweets. Goddess Parvati is worshipped by the bride decked up in traditional Marathi attire and Jewellery. This is the arrival of groom in the mandap. A cloth is held between the bride and groom preventing them from seeing each other. This cloth is called Antarpat. The bride is led to the mandap, both the groom and the bride takes the holy wedding vows and exchange garlands. People present in the ceremony shower rice grains on them. The father gives away his daughter as ‘daan’or a gift to the groom. According to Vedas, Kanyadaan is important for the bride’s parents in order to attain Nirvana. The circumnutating of the couple 7 times around the holy fire, called ‘phere’. This is the ending ritual of a Marathi wedding. The couple does a final prayer and asks all the guests for their blessings together. The Marathi name for Vidaai. The welcoming of the newly wed couple at their house. The groom’s mother washes their feet with milk, honey and water, does tilak and aarti before they enter the house. The bride knocks down a bowl of rice with her with her right foot before entering. This is supposed to bring good luck. 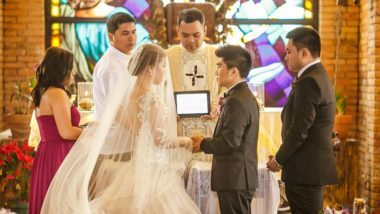 The groom’s family throws a grand dinner party and invites all friends, family and distant relatives as a gesture of welcoming the wife as well as for the meet and greet.